Make Father’s Day special with this typical Italian recipe from Campania region, to be served on Novacart Oy trays. 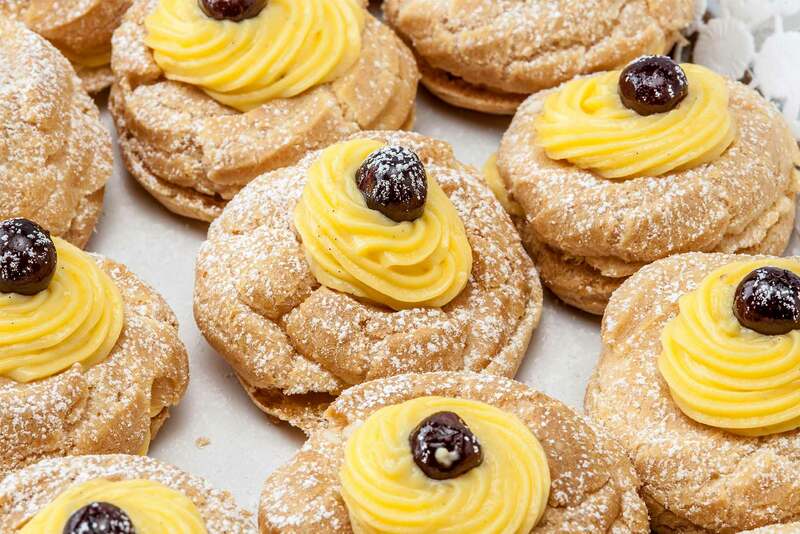 This traditional Campania region’s dessert is famous throughout Italy and it’s a great idea to celebrate Father’s Day with your family. In this version, you’ll cook the pastries in the oven instead of frying them, to make the recipe lighter. Let’s start with the dough. Put the water, softened butter, salt and sugar in a small pot and cook until boiling. Turn off the heat, add the sifted flour, mix and put back on heat for 5-10 minutes. After letting the mixture cool down, add the eggs and mix until it’s smooth and homogenous. Put the mixture into a piping bag with a star-shaped spout and create circles or small donuts with the dough on a baking sheet. Bake in the oven at 200° C or 392° F for 20 minutes. Turn off the heat and let the pastries rest in the warm oven for another 10 minutes. Let them cool down. To prepare the filling, whip the eggs with 3,5 oz of sugar and add the sifted flour. In the meanwhile, heat up the milk with the grated lemon peel, and then add it to mixture slowly. Put the mixture back on the stove and stir it until it’s thicker. When the cream has cooled down, add the ricotta cheese previously mixed with 5 oz of sugar. When both the pastries and the filling are ready, cut the pastries in half, and fill them with the ricotta based filling. To decorate the desserts, add some of the leftover cream on top with a candied cherry or a canned sour cherry. Finally, sprinkle some powdered sugar. The Cardoboard tray Oy 8 is made of cardboard coupled with Pet film, and it’s an ideal product for the presentation of confectionery products. It’s resistant to food fats, ideal for pastries. Available in gold and white, its elegant design is perfect for the presentation of the finished product.